This new restaurant is in soft opening phase in Red Bank. Chef and co owner Chuck Lesbirel (ex of AMA), has done a nice job converting the old Dish space. We came on their 4th night of business and I can tell you…the food is delicious! Starters of baby burrata with peaches, and local clams were excellent. We shared two homemade pastas, the pea agnolotti and the pappardelle bolognese. Both perfectly cooked and delicious. We’re still talking about the pea agnolotti today!, we shared a main of perfectly cooked scallops. They were incredibly sweet and paired with cauliflower purée, a great dish. Service was super attentive and caring. All in all we really enjoyed our first (of many) meals at Semolina and wish Chuck and Shane the best of luck. One of the problems with Dish was that there was no place to comfortably wait for your table if it wasn’t ready. Have they done anything to solve that issue? Also, are tables as closely packed as they were at Dish? No website yet but via the Google, I see they will be taking reservations on OpenTable starting Tuesday, July 3rd. OT has the hours and the full menu which looks good. I don’t think there’s much of a place to wait, and the noise factor that was at Dish is still an issue… but the food is for real!! Thanks for the reply! I actually don’t remember excessive noise during the one meal we had a Dish more than 10 years ago. But because these days it is a major deterrent for me no matter how good the food may be, I appreciate the heads up. I’ve found the food at the Italians in our area to be mediocre at best (the sole exception being SamVera five minutes from our house), so we do our Italian dining out in Manhattan and are fortunate to have several Italian spots walking distance from our apartment that have excellent food and are not hideously noisy. Since it sounds as though Semolina is a cut above food-wise, I might consider going there midweek when most NJ restaurants are not very busy and are therefore quiet. That’s a shame because honestly I just find the dining room for the space very off putting. The noise at dish was one of the top reasons why we stopped going. I hope that Semolina put up some of those sound proofing boards on the walls and ceilings to help that issue. Can’t wait to try! Had predinner drinks at 26 West … first time visit. For those that haven’t been there’s a smallish bar at the entrance of the restaurant and a larger bar towards the rear that overlooks part of the dining room and large windows looking out to the Navesink. A very attractive space (they are apparently constructing a rooftop space as well). All the seats at the bar were taken but one, so my wife took a seat, I stood behind, and we waited and waited and waited (10-15 mins) before one of the four people behind the bar finally bothered to look our way. The service was indifferent, and really turned off my wife who is in the hospitality/restaurant business. They had 20 or so beers on tap and I had hoped to sample a couple, but with the lost time I only had time for one drink so went in a different direction. I requested an Old Fashioned or something similar. The bartender suggested a Vieux Carre which I never had (comes out of New Orleans). Fantastic drink and great suggestion. Made up a bit for the service. On to Semolina. Did I say go, go, go? As noted upthread, it’s the old Dish space. From my Friday night visit in a completely full restaurant, I can attest that they have not addressed the noise problem. It was raucous from the time we arrived (around 8:30 until about half the restaurant had cleared at around 9:30). Hopefully they plan to take steps to mitigate the noise issue. They are only 6 days operating and there were some minor service issues but nothing that detracted from the enjoyment of the food. Our server, Shane, who we learned is married to the Chef/Owner was an absolute pleasure and was extremely welcoming. Our meal selections were very similar to sockster’s - burrata with peaches and tomatoes which we dressed up with a very nice balsamic served on the side and amazing clams served in a white wine/garlic combo (I think). The burrata was great, the clams and broth were outstanding. For mains we stuck to pastas. I had the pea agnolotti. If you like mint, run to order this while it’s still on the menu (was told it’s coming off in 2-3 weeks to be replaced by a pasta featuring Jersey corn). The other order was the crab and pasta minus the bacon which my wife doesn’t care for. Like the apps, the crab and pasta was great, the agnolotti was outstanding. At Shane’s suggestion, we shared a peach galette for dessert. Flaky and buttery and not cloyingly sweet. A nice end to an excellent meal. It’s been a while since I’ve been excited by a new opening. Semolina seems like it has the potential to be a real hit. I agree with you completely. We went last night for an early dinner and I asked about the noise issue. The noise panels are on order and should be here in a few weeks. They are quite costly as they need to be custom fit so they didn’t want to further delay opening. I am THRILLED they are dealing with this issue since the food is amazing. We split the asparagus appetizer. Which had good components, I just was a little confused about what they were doing together. Grilled asparagus with hard boiled eggs. Full disclosure, it exactly said that on the menu but I didn’t notice. Regardless, our 1 year old ate most of it so total win there. For mains, I got that delightful pea agnolotti. SO yum. Fresh and bright. My husband got the sausage orecchiette which he greatly enjoyed. The pasta is homemade. We also split the peach dessert. Light, buttery and super tasty. I haven’t been this excited about a new restaurant in a while. Absolutely go. I can’t wait to come back. We actually went back for a second time Saturday night. They tweaked the menu from the soft opening. Meatballs with polenta was excellent. The crab “carbonara” was cooked al dente and was delicious. We shared the pork chop- it too was delicious and perfectly cooked. The peach galette was the perfect end to our dinner. Service was excellent again and although still noisy, it didn’t detract from dinner. Lastly, the two guys running the food and water, Teddy and Seamus, are both awesome!! OK, put me down on the list for enjoying my meal at Semolina. We had exactly what most of us seem to have, the pea agnolotti, which was very good and the butter sauce and smooshed peas were great with the bread, the burrata, which nicely blended ripe peaches, tomato, and the cheese, the pork chop which was very tasty and just perfectly pinkish and juicy, and the peach galette. As to the noise we were torn. They were playing classic rock so I wanted them to turn the music up, but the conversations were indeed loud enough as it was, so I didn’t want them to turn up the music. All in all a very good meal. Elbow room? Honestly you know me, how comfortable would I be? Funny you brought this up, because from Dish I remembered two main issues. The noise and the super tight tables. So, I purposely made my reservation for 3 and asked for a highchair. My hope was they would seat us at a 4 person table instead of a 2 person table with a high chair. A 2 person table and a high chair is NOT realistic or comfortable. As planned, they sat us at a 4 top which worked out great. I didn’t feel awkward about the restaurant potentially losing on a 2 person table because it wasn’t fully booked, we ate early and left a generous tip. EDIT: to answer your question - some tables are tighter than others. If you want room to spread, I would request a 4 top table rather than the 2’s. The 2’s are small. We went here again Saturday night. Wow. Really good. The majority of the noise panels are up and it makes a considerable difference. We had an early reservation (545) and it was definitely was louder in there by the time we left but still you are able to hear the other people at your table. 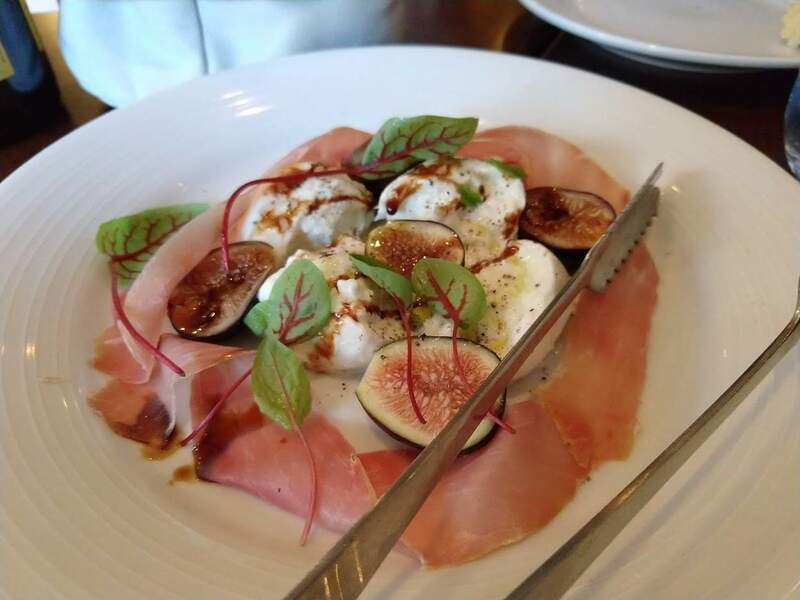 Started with mozzarella, fig and proscuitto. This was the highlight for me. Perfect figs, delicious, creamy cheese, salty meat. YUM. Entrees: my husband got the roast chicken (I thought an odd choice, but really very well done). I ordered pasta with mixed mushrooms in a light white sauce. Delicious but not heavy or based in cream. Dessert, zeppolis. Start to finish, everything was awesome. Service was friendly and accommodating. I can’t wait to come back. But, a word of caution, the small tables are small. We were originally seated at a 2 top. With a high chair, that wouldn’t have been realistic and we would have had a greatly different experience (we were on the verge of leaving). Luckily another party that was supposed to be a 4 turned out to be a 2 and our tables were swapped. @NotJrvedivici or @seal, Since there is already a Semolina thread (which, by the way, was started by sockster), to keep all discussion of Semolina together, you might consider transferring this post to that original thread. I will in the morning when in front of a pc if @seal can’t do it sooner.